The Black Panther Party was founded in Oakland, California by Huey P. Newton and Bobby Seale in October 1966. Originally called the Black Panther Party for Self-Defense, the Party was an African-American organization established to promote civil rights and self-defense. 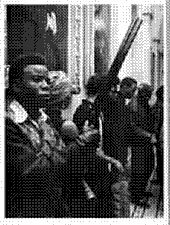 The Black Panthers were active in the United States from the mid-1960's into the 1970's.